Picture Perfect view from our hotel room! Early January, people start trickling back to Johannesburg with tans and happy holiday stories. We had stayed home for a quiet (I confess that it may be because I am a bit schnoop about going on holidays during the peak season) Christmas and were now feeling restless to get out of town. A February trip down the Garden Route sounded in order, so I left Rob (aka The King of Holidays) to do the research and make the bookings. Imagine my surprise when he arrived home with two tickets to Venice instead! It turned out that there was a special on Emirates at R3800 per ticket including taxes. Let’s go, Lets Go, Lets Go! I don’t know how Emirates manage this on modern planes with great cabin staff, delicious in flight curries, but kudos to them! 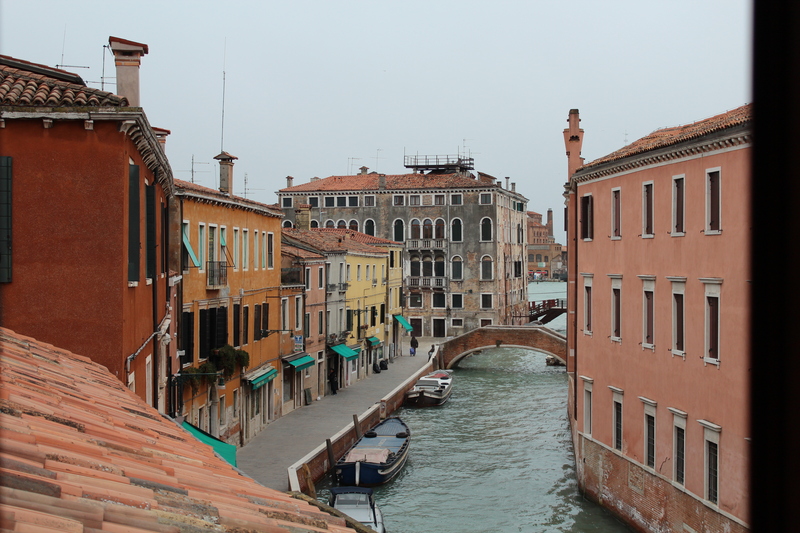 I’d always dreamed about going to Venice. When I was a little girl, I remembered seeing pics of my grandfather on a Gondola. He was a bit of an adventurer and there wasn’t a country he did not want to see. I couldn’t believe that we were on a water taxi from Marco Polo airport to the city – if you are planning on visiting Venice, just remember to catch the Alilaguna water taxi and not a private one….the private taxis are hugely expensive and you will kick yourself in Euros! We stayed at a hotel called San Sebastiano in the Dorsodurro precinct – a good location as it is close enough to everything but not as expensive as the San Marco or the Rialto area. 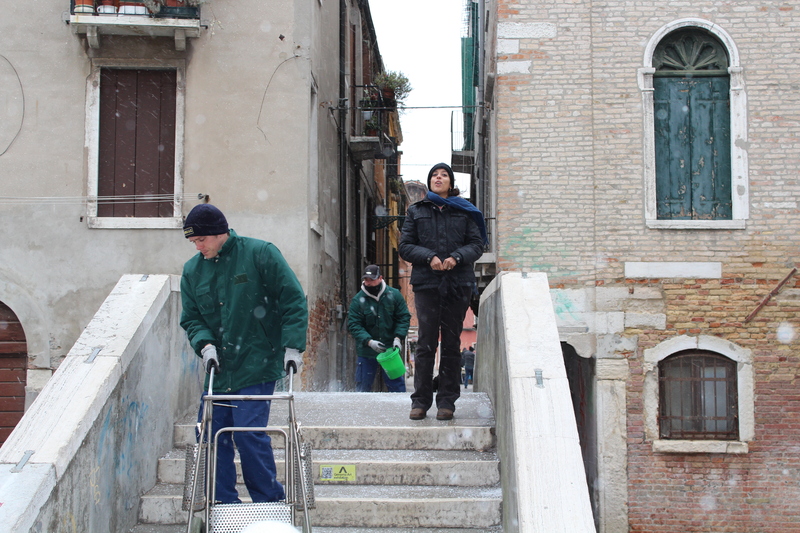 It was obviously Winter and we arrived at the beginning of a particularly cold snap – on our first walk we saw a few locals throwing salt on the sidewalks and the bridges so that people didn’t slip on the ice. And then it started snowing!! This prompted us to make the first of many cafe and bar stops – we tried both hot coffee and alcohol to warm up – I recommend the alcohol as it did work best. 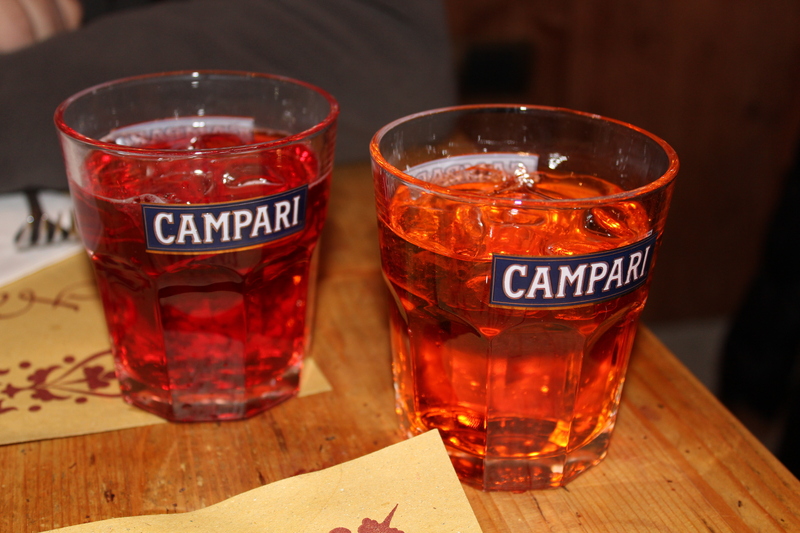 The locals drank a lot of Spritzers – this is Campari mixed with white wine and soda. A slightly less bitter option is with Aperol instead of Campari ( I saw these being marketed at the Baron On Main last week). 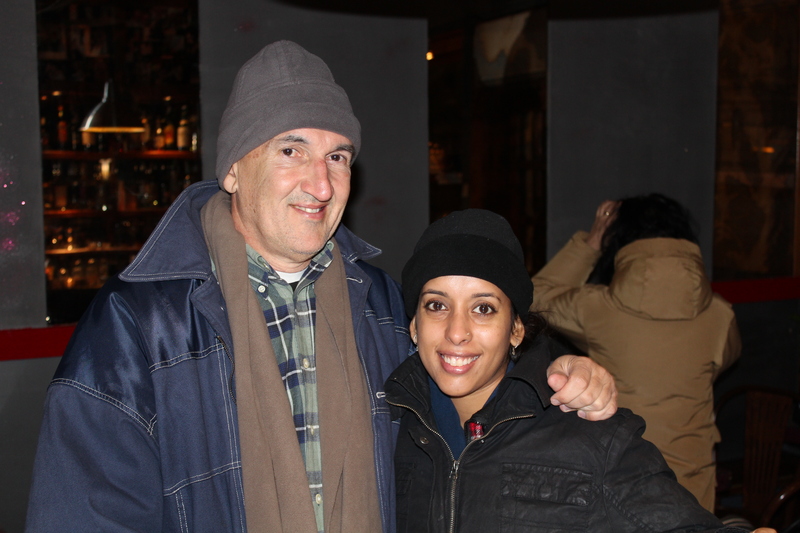 We were continually surprised at how quickly locals would come into Osterias and leave. They would order an espresso, chug it back, slap their money on the counter (usually with no tip) and leave. This may be partly due to the fact that having a drink while standing at the bar is way cheaper than sitting at a table – we found this out at our cost. On tipping, we found that waiters in Italy do not expect the 10% plus that is the norm in South Africa. Apparently this is because they are paid a reasonable salary and do not need to earn most of their income through tips. Unfortunately, you might save a few Euros on tips, this pales into insignificance next to the cost of food and drink – even though we tried to eat at the places that were frequented by locals, we really paid top dollar for often mediocre food. 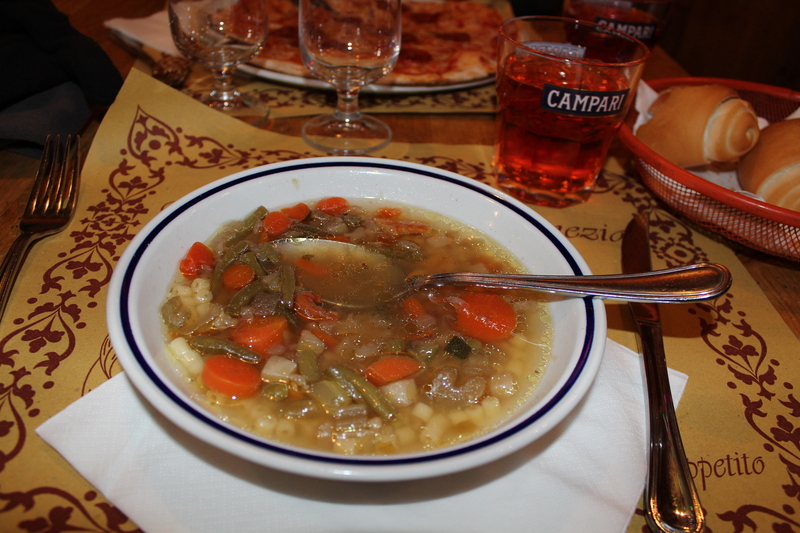 I remember paying around 12 Euros for a minestrone at a restaurant near the Piazza San Marco! I often thought how lucky we are in South Africa for the quality and prices in restaurants. 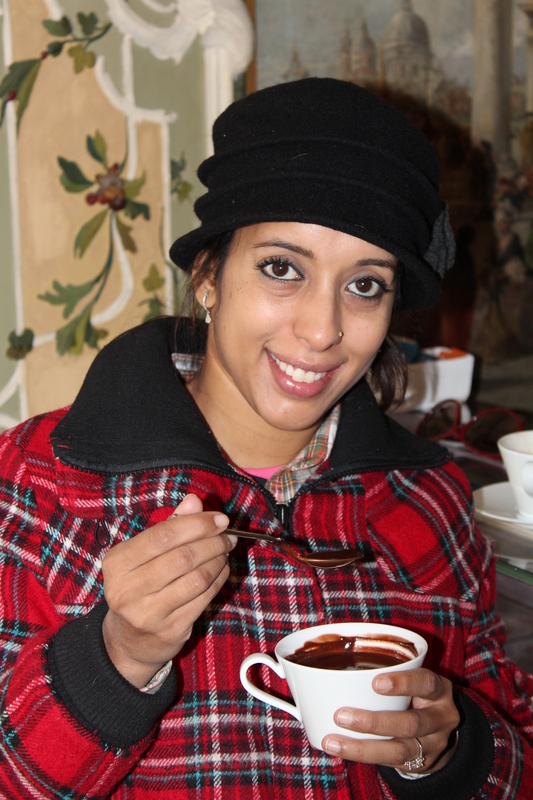 Luckily, we did find some fabulous pastas, mouth-watering coffees and hot chocolates, and silky smooth red wines such as Valpolicella. Most tourists have said they have been lost in Venice…Rob and I got lost everyday – the buildings and little pavements start to look quite similar and we simply lost our way! There were days when I just thought we were never going to get back to the hotel! The first day in Venice was spent walking around the city and popping in at an osteria when we needed to get out the cold. Piazza San Marco has three tourist attractions – Basilica San Marco – the Byzantium style church, Doges Palace, and Torre dell’Orologio – the clock tower built somewhere between 1496 and 1506. I just kept thinking, James Bond was here!! !